The history of blackjack can be traced back as far as the fifteenth century. Due to the invention of the printing press in the 1440s, playing cards no longer had to be hand painted and therefore became much more affordable. Roger Baldwin, of the Four Horsemen of Aberdeen traced the game back to a sixteenth century Spanish game called trente-un. In this card game, the objective was to get a hand closest to 31. The ace counted as 11, and having an ace up the sleeve significantly boosted your chances of winning, as it would do in blackjack. However, Arnold Snyder points out in his Big Book of Blackjack that the connection to trente-un is made slightly confusing because more modern versions of trente-un became very unlike blackjack. He concludes that the original trente-un is the predecessor of blackjack but has developed differently since. However, its basic structure did live on in a number of derivatives. Snyder concludes that the original trente-un and the card game Bone Ace (mainly played in 17th century England, but with the earliest references to the game dating back to the mid 16th century) were at one point the same game. This provides proof that trente-un is in fact the predecessor of blackjack. In Bone Ace the card values are identical to those in blackjack, the numbered cards assigned valued by their number, the court cards all counting as ten, and the ace carrying the unique double value of either one or eleven. It was played with a single deck of cards, and bets were placed before dealing. All players were dealt three cards at the beginning of the game. Cards were dealt three at a time and from the bottom of the deck, two face down and the last face up. The player with the highest Up Card wins the Bone, a seperate bet of one coin made by each player. Players could then “stick” (stand) or “have it” (hit) and draw additional cards to reach a hand value closest to 31 without exceeding that number. Being dealt 31 wins, drawing 31 wins, and busting loses. If all players bust before the dealer’s turn then the dealer wins automatically. In case of a tie, the elder hand (the hand closest to the dealer’s left) wins. In case of a tie for the Bone involving aces, Bone Ace (the ace of diamonds) wins over all. There were other card games that preceded blackjack that had a similar goal of getting a hand as close as possible to a predefined number without busting. 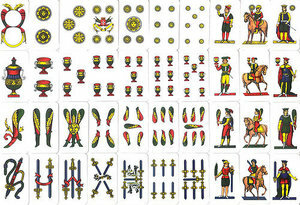 Such games include Quinze (15) and Sette e Mezzo (7 and a half). Both games share certain similarities with blackjack, but they each have certain differences which make them unlike blackjack in other aspects. One basic dissimilarity to modern casino blackjack that holds for both Quinze and Sette e Mezzo is that no different set of rules binding the dealer to a certain strategy of play existed. These games were never house banked, so the dealer was often a player (or a cardsharp) who could afford to bank the game. Because the dealer made his own strategic decisions, it was possible for players to bluff the dealer into making the wrong ones. 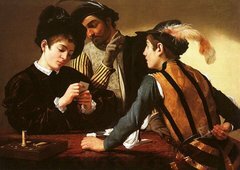 This is a 17th century Italian card game in which the goal was to get a hand as near to a value of seven an a half as possible. One clear similarity to blackjack is that busting loses automatically. If a player busted he had to turn up his cards and the dealer would collect his bet. This means that, as in blackjack, even when the dealer busted, players who busted before the dealer did would automatically lose their bet. Some structural dissimilarities include, aside from the number 7 and a half, that the game was played with a 40-card deck from which all 8s, 9s and 10s had been removed. The card values differed for court cards and aces too. Aces counted as one, and face cards all counted as a half. The French gambling game quinze appeared a little earlier than Sette e Mezzo, in the sixteenth century. It is, as Arnold Snyder puts it, much “like blackjack with bluffing”. The goal of Quinze was to get a total hand value of 15, but a bust did not automatically result in a loss. Court cards counted as ten, and the ace as one. Each player was dealt one card face down, the dealer played his hand last. If the player got a total of 15 after hitting he would turn his cards face up and would be payed off 2 to 1, provided the dealer didn’t also get 15. Unlike blackjack, if a player busted, they just pretended to stand, and hoped that the dealer would bust too, since this would result is a push rather than a lost bet. Because the dealer was not bound by house rules as to how to play his hand, it was possible for players with weak or busted hands to bluff the dealer into hitting and busting. The structure of the game is thus similar to blackjack, but the game had psychological aspects more alike to poker. 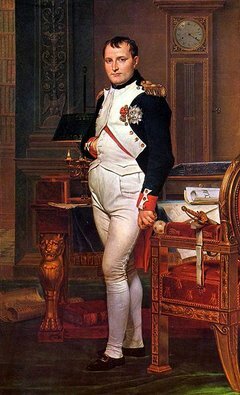 Vingt-et-Un, or “twenty-and-one” appeared in France midway the 18th century, and among its celebrity players was no one less than Emperor Napoleon. It is definitely the same game as blackjack, though at the time it was introduced casinos did not bank these kinds of gambling games. They would offer a table for play to a wealthy player or a number of wealthy players who were in the position to bank such games themselves. The casino would then receive a cut of the profits. This was, on the one hand, beneficial to casinos, since it was not their own money that was at stake. If the banker won the casino made a profit, while if he lost the casino did not lose any money over it. However, this meant that the height of the stakes depended on the wealth of the banking players, and casinos were often in a better financial position to afford banking high stakes games. Player banking also meant that there were various different ways of playing the game. There were versions of Vingt-et-Un where the dealer was one fixed player, but in the case of a group of wealthy players one rule variation that was also played was that the dealer position was passed on to any player who got a natural 21. Vingt-et-Un only became known at Blackjack in the 20th century, when it was being played in the illegal casinos of the American Wild West. To read more about this chapter in the history of Blackjack, read on here.